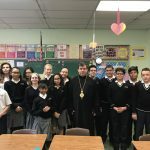 Bishop Andriy visits Assumption School in Perth Amboy, NJ. A visit from Most. Rev. 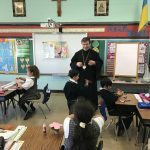 Andriy Rabiy, auxiliary bishop for the Ukrainian Catholic Archeparchy of Philadelphia, during Catholic Schools Week was a special treat for students at Assumption Catholic School in Perth Amboy, NJ. It’s not every day that a school gets a visit from a bishop on Catholic Schools Week, but Assumption Catholic School was fortunate to have him with our school community the entire day. 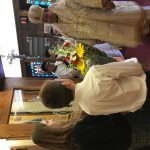 Upon his arrival, His Excellency was greeted in the church vestibule by ACS students with traditional gifts of bread, salt and flowers. His visit fell on the Feast of the Presentation of Jesus at the Temple, also known as Candlemas and the Feast of the Purification. 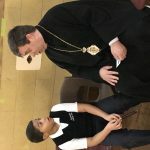 During the morning Divine Liturgy that he celebrated for the ACS community, Bishop Andriy blessed candles and reminded all students that these candles symbolize that they are called to be light, just as Jesus is the Light of the World. He also presented five distinguished parishioner-students with generous Scholarships for their continuing education. 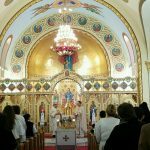 Following the Divine Liturgy service, the school presented a short concert and a festive breakfast in honor of His Excellency and his historic visit to ACS. During breakfast the students, faculty and staff also honored the hard work and sacrifices that police officers have to make every day in order to safeguard our country and our community. 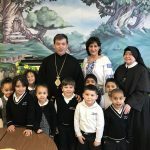 The bishop was warmly greeted by the principal, Mrs. Lissette Shumny who thanked him for taking the time to visit with the students and then Rev. 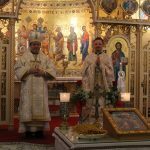 Ivan Turyk, pastor and the school administrator, escorted him through the school. As he moved from classroom to classroom the Bishop answered a variety of questions from the enthusiastic students, ranging from when he decided to become a priest (17 years old), to what he would have been if he wasn’t a Bishop (a teacher), to what is his favorite Old Testament book (Exodus), to what sport does he like the most (soccer), if he has met the pope Francis (not yet) and if it is fun being a bishop (Yes). In addition to visiting with the students and answering their questions, the bishop was presented with a handmade “heart” of thank-you and good wishes cards from the students. 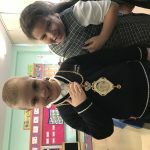 During the bishop’s visit from grade to grade, you could just see and feel the energy and love that he has for the students and that they feel for him. 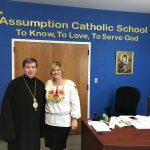 Bishop Andriy’s first visit to ACS demonstrated his great support of Catholic Education and of the parents who make the sacrifice to send their children to Assumption Catholic school. 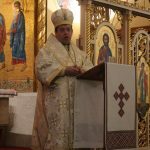 Prior to departing, Bishop Andriy had lunch with teachers and staff members. Everyone agreed it was a truly memorable day for our school and it was definitely a wonderful way to end Catholic Schools Week at ACS.